OTT platforms have increased in popularity because they provide on-demand access and cater to a wide range of preferences. Video content is no longer confined to television screens with its availability increasing across multiple new platforms including mobile devices and laptops. 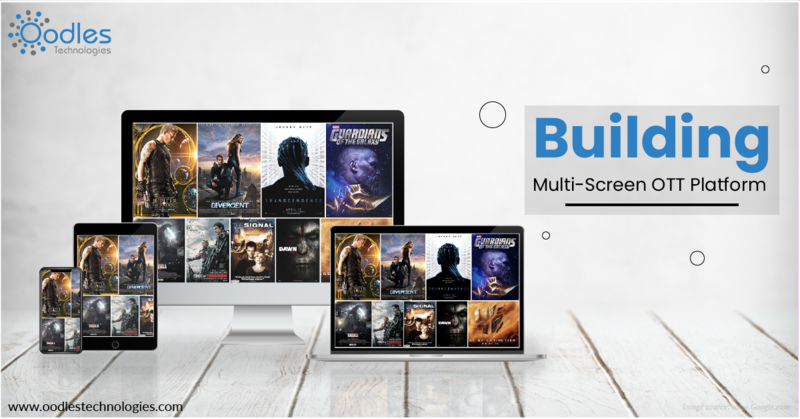 Building multi-screen OTT video platforms are challenging since it involves a huge investment in app development and video delivery. Let’s take a look at some aspects that affect the development of multi-screen OTT platforms. Consumers reacts differently to the content at their disposal. Some prefer a comedy show, while some like viewing horror shows. It is the changing viewer preferences that gave birth to OTT platforms. They enable viewers to choose a channel or select a show of their choice at a time and place of their choosing. Audiences prefer a personalized viewing experience, therefore, content offerings are now open to multiple screens. Individual viewer prefers to control their viewing experience as OTT platform gives them this opportunity with a wide variety of choices. Oodles Technologies OTT video streaming platform experts keep an eye on changing consumer preferences and design applications that generate revenue for media enterprises. Earlier OTT platforms were not ruling the Video content market, the only leaders were operators that delivered scheduled content. Consumers had to select an operator to view a television series or movie at the scheduled broadcast time. Video Content market has undergone a rapid change since consumers are readily accepting OTT technology. In fact, traditional video content providers are facing a tough competition with OTT video delivery solution providers. Demand for OTT platform is increasing and trends show that soon customers will swap traditional video platforms with multi-screen OTT Platforms. Oodles Technologies has set new benchmarks in the OTT space by creating dynamic and user-friendly online video content platform. We enable video content providers to organize and manage their content by using our advanced video solutions. Our in-depth expertize and proven methodologies play a critical role in delivering an engaging OTT platform efficiently. We provide native set-top box solutions that are fast, intuitive, and engaging. Our OTT experts develop high quality, robust apps for multiple VOD and OTT platforms including Amazon Fire Fire TV stick TV, Roku, Apple TV, Samsung TV, Vewd TV, webOS SDK, Foxxum OTT, Google Chromecast and more. Oodles specializes in creating feature loaded Smart TV applications using SDK technology. Our developers build user-centric smart TV apps for clients which enable them to showcase their brand and market their products with ease. We have expertise in developing Smart TV apps for Samsung Native, Tizen, Opera, and others. We integrate Video Content Management System( CMS), video chat and conferencing with existing OTT platforms. We help clients communicate and collaborate with businesses overseas to facilitate business expansion. We also provide features like sharing and recording to help businesses and teams collaborate and work together effectively. We integrate WebRTC in business-specific web applications to enable our clients to position their brands through scalable WebRTC application development. We facilitate peer-to-peer communication across mobile devices and web for client projects, employees, or standalone users. Our solutions include real-time text chat, screen sharing, audio-video communication, data exchange, live streaming, tracking, recording, and more. Our OTT experts achieve uninterrupted delivery of high-quality videos (live and on-demand) to web-connected devices with Content Delivery Network (CDN) for high user engagement. Our CDN offerings include CloudFront, Google CDN, Tata Communications CDN, and more. Oodles Adaptive Bitrate Streaming(ABR) help businesses interact with audiences and deliver videos in a hassle-free way. It provides improved performance, optimal quality, and adaptive bandwidth. Our video and Image analytics reduce manual work and accelerate business operations. We help clients manage their media assets by facilitating easy retrieval of data from an image, text, or the audio/video content. Our developers use special designing algorithms to detect objection, motion, media customization, and patterns. Interactive video solutions provided by our experts help generate leads for your video streaming business. Our services achieve enriched user experience, improved brand loyalty, and better revenue. Our 360 Degree Video Streaming services lead to high-quality videos necessary for a successful video streaming business. We create animated and mixed graphics live action videos that provide real-time interaction with customers. Our services provide support for 360-degree video and VR across desktop/mobile browsers, live streaming, quick video analytics, and VR Headset Streaming Integration. We provide video surveillance solution to analyze optimal performance and real-time monitoring. Our video surveillance development includes IP and analog systems, cloud-based storage, monitoring and verification capabilities, video analytics, reporting, and access control. Are you planning to launch a video streaming app that can provide customers with a real-time entertainment experience? Get in touch with our OTT team at Oodles Technologies to avail feature-loaded, scalable, live video streaming apps at competitive prices. Apart from this, we have expertise in developing solutions using next-gen technologies like blockchain, machine learning, artificial intelligence, ERP, big data and more. For details on creating an OTT platform and other related services contact us now!